Just a quick outfit today, worn to do some charity shopping and job hunting. 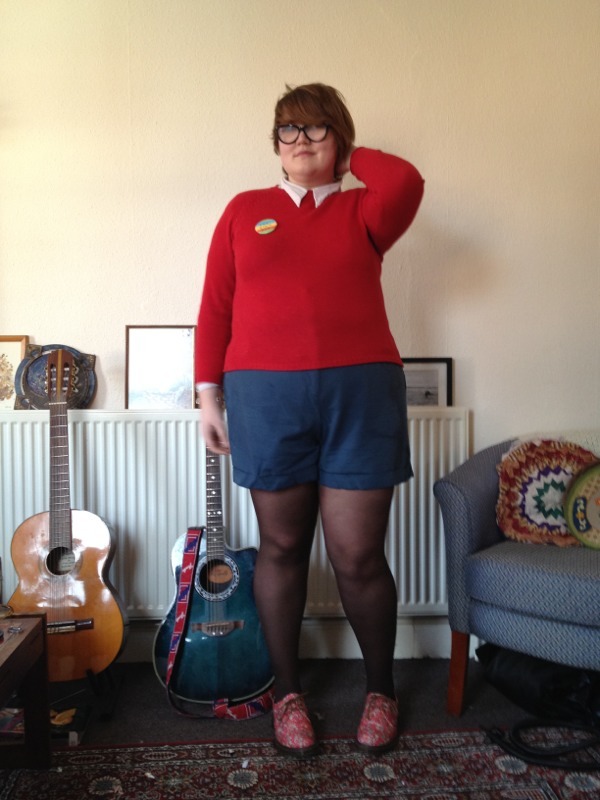 The jumper was a bargain find for £1.50 in a charity shop, and the shorts are from Asos during the sale. Just a quick post this evening to feature a skirt I made last night. I was in Leeds market during the week, and I found this ace thick black stretchy material on a £1.50 a metre sale rail (my fabric shopping haunt of choice!). I bought it on a bit of a whim, without a project in mind. I've been looking to replace my black mini of choice recently, as it's a bit small right now, and it occurred to me that I could probably use some of this fabric to make another. I did this by simply tracing around the outline of another mini that fits well (I also drafted a simple waistband also based on the other miniskirts). My fabric has a slightly less stretchy fabric content, so it came out a little tighter (good though, as the other mini is a tad big around my thighs!). I also decided, on another whim, to add a peplum to the skirt, after watching this youtube tutorial, which is really simple and I would fully recommend! I wore it out crafting today and am impressed at how comfortable and clingy it is! I might even yet make a pencil skirt version. It's nice to know that I can make my own basics when I need to. Best of all, this cost me all of about £1 to make as it required less than a metre of fabric! Now that this blog is well established, I'm starting to offer small advertising slots on my sidebar. These are available to bloggers, etsy shops, eBay shops, and small and large businesses, and are now up for grabs! The placing can be seen by viewing my home page. As an advertiser, you will have to supply me with the image itself. These adverts are currently priced at £8 per calendar month. Additional features such as product giveaways or reviews can be discussed in addition. 250x250px adverts can also be arranged for £15 per calendar month. My readers tend to be based in the UK, US and mainland Europe, and are largely either plus sized women or vintage enthusiasts. Advertisers are at my own personal discretion, and I am not interested in featuring weight loss or diet related products. I reserve the right to refuse any content that is not appropriate or relevant to this blog's content. If you are interested in this opportunity, please contact me directly at fattyunbound@gmail.com. I've owned this mustard yellow midi skirt for a good few months now, and worn it sparingly. I got it in the Dorothy Perkins sale, but have never quite twigged onto the perfect way to wear it, without it looking a bit frumpy and long (I like my skirts mid-thigh, and this is mid calf!). I twinned it with my black velvet scalloped mini dress (which I think I love more as a top now!) to wear to work this week, and I think finally got the styling right. The wide scalloped neckline of this dress, combined with a full skirt, feels very 50s to me - it's simple with just the right amount of unique detailing. I'd love to be able to master a scallop in my sewing projects, though sadly I don't seem to get along with circular hemming. Hmm. Another absurd work outfit today. I'm really into red, orange and mustard yellow at the minute (you can probably tell?). I had a lovely Saturday this weekend, pottering around my favourite Yorkshire charity shop haunt (Otley, for those interested - about ten charity shops, most reasonably priced, not to mention some lovely cafes and the best bookshop ever). To celebrate a thrifty day, I wore my most recent find - this black velvet mini, which I found the weekend before for £3 in Nottingham, where my dad has recently moved. I teamed it with my garish stripey tights and a new brooch, from ASOS's sale. My finds included a Spare Rib compilation book, a wool kilt, a fab bright red jumper and er, too many books. Good day! I have to say, the longer I've been temping, the more brash I'm getting with my clothes. I work in an office currently that's full of pastels and proper workwear, and lately lots of unpleasant healthy lifestyle fat shaming rhetoric, and it's kind of hard on me in some ways. I've been coping with my favourite self care mechanism, which is basically dressing obnoxiously (within certain limits). This pink dress was a sales find from Next, from the maternity section (though my belly fills it minus sprog! ), which is definitely a good resource if you are big bellied or pear shaped like me. It's another jersey mix, so comfortable day wear with just the right amount of 60s-ishness and obnoxious loudness for me. Here's another belated work outfit for you. The waistcoat and shorts were sale buys this year. I tried to focus my sale purchases more around versatile separates to replace long suffering favourites of mine, instead of cooing over all the pretty and ridiculous dresses as per usual! This was one of those outfits for a day when you accomplish nearly nothing (in my case, a fry up at my local, and loafing around at home) but still fancy looking a bit ridiculous. This detachable collar is my new favourite thing EVER bought from Romwe here (if you do some googling, you can find a few discount codes too! I got this for about £6.50 including shipping.) I've been trying to make my own for a while, but this is really well made with some scalloping that I could never replicate myself. I wore it with my beloved Dorothy Perkins circle dress annnnnnnnd my Christmas present this year, which is a Cambridge Satchel! I've lusted after these since before I went to university (8 years! ), but always ended up with vintage satchels instead, even though they tend to break almost instantly. Suffice to say, it's not left my shoulder yet. I do sometimes find myself wondering if I'll ever grow out of dresses, docs and cardigans. I feel like I've been dressing in this outfit (and variations) since I was a teenager, and it's just so comforting. This cardigan is my new favourite thing ever, unsuprisingly given how much I've posted it, and I'm enjoying living in this interchangable outfit in the cold days and dark mornings, when more elaborate ensembles are too much to deal with. Okay, so I don't normally do "end of year" or summary posts, but this year has been crazy, and I wanted to do something to say goodbye to it. I've spent 2011 moving three times, between Brighton and Leeds more often than I'd care, and I've maybe been more inconsistent that I'd like with this blog. Real life has taken over more than I wanted, and I'm hoping that 2012 will allow me to maintain more steady contact on here. I started this year with a few loyal followers, and through the course of it gained many more (mainly thanks to my television appearance, but also to the many kind people who've linked to me, recommended this blog, and said generally nice things about me). I've become a more visible part of a community of fat positive bloggers, some of who have become good friends, some of who I hope to meet in the future, and all of which continue to inspire and stimulate me (in a fashion sense and also in a badass fat activist way). I've been to awesome events, swaps, conferences, and even organised two of my own! I hope that 2012 will involve more community building, events, and support for each other. 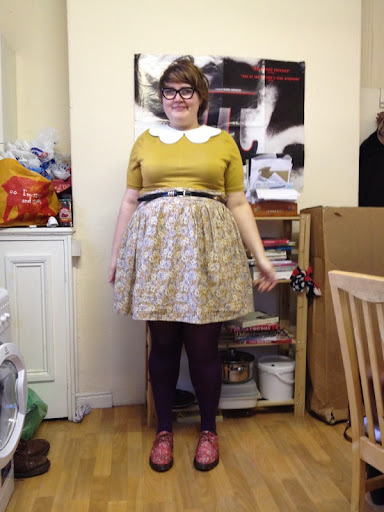 I'm personally aspiring to run more swaps, spend more time teaching other fats to sew haphazardly (or even well! ), and to improve my own sewing skills to the extend where I can make better clothes for me, and maybe even custom make things for others. 2012 will also be the year I publish my own zine for the first time, and there'll be much more on that subject soon. Without being emotional, I just wanted to say that I appreciate everyone who reads this blog. I'm glad to be another small piece of an online community of people who are challenging bodily norms and living visibly, proud and powerfully in bodies that are alienated and oppressed by mainstream discourses. I wanted to ask, too, what more you all want to read here. This past month or so I've not been writing much - instead I've put that towards zine making and finishing articles for people. I always want outfit posts to be a big part of this space, but I wanted to open it up to all of you - what else do you want to see more of? Tutorials? Politics? Histories? What do you want to know more about? Still wayyyy behind with all of my outfit posts - I still haven't posted about my sales purchases! Here's an outfit I remixed for work before Christmas - the dress is a summer sale purchase, and one of my staple work dresses. I'm not great with tailoring (you might have noticed), mainly because my body completely changes shape when I'm sat down (this move turns most knee length shift dresses into minis! Not good! ), so I try and go for smart jersey pieces instead. In other news, I'm super excited about Plus London 2! Claire of Monkey Fatshionista is organising it this year, and it looks great. Brands involved include Domino Dollhouse, One Stop Plus, Simply Be and Anna Scholz, and there's going to be a fashion show, pop up photography studio and a clothes swap (so you know I'm there). Hopefully I'll get my arse into gear and finish my zine in time for it too! It's open to bloggers and friends of bloggers, and you can see the facebook event here and the tumblr here. If you want to attend, drop Claire a line at supermonkey79atgmaildotcom to RSVP. Hope to meet some of you there!